Wharton State Forest | JORBA - You Dig? Please join us for trail maintenance and rides. The Wharton Forest Bicycle Trails start in the northwest corner of the Batsto Visitor Center parking lot, located on Batsto Rd a short distance off of county rt. 542. Visit NJ's Parks and Forestry Wharton State Forest web page for directions to Batsto Village. 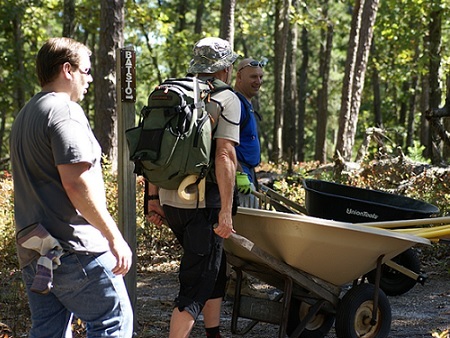 The Jersey Off Road Bicycle Association's Wharton volunteer effort helps maintain off-road bicycle trails in Wharton State Forest. These off road bicycle specific trails originate at the northwest corner of the Batsto Village parking lot and offer bicyclists several distance options. Maintenance on WSF's Batsto area trails began in September 2006 with a one day trail building school taught by Kristin Butcher and Ryan Schutz from the Subaru/IMBA Trail Care Crew. Along with unscheduled storm recovery work, and the scheduled fall-winter-spring trail maintenance,the JORBA Wharton Trail Users are also able to regularly schedule (due to our volunteer status and the graciousness of the forestry staff) evening rides that originate from the Batsto Visitor Center parking lot. We post our scheduled rides, scheduled trail maintenance, and unscheduled storm recovery work on the JORBA calendar and on the Jersey Off Road Bicycle Association's Facebook page. If you have the time, want to help, and have some fun, please join us. Trail maps are available at the Batsto Visitor Center. All of Wharton Forest's bicycle trails are bike-hike only and marked with colored circles. Please do not ride the hiking trails that are marked with colored squares. Please do not bicycle through Batsto Village. The JORBA WSF trail work and rides are scheduled October to April. Check the calendar for dates. Must be over 18 years old to participate. Helmets are required to be worn on all rides. Bringing tools, spare tube and hydration is highly recommended. Lights are needed for evening rides. Ride length and pace varies. (10, 12, 19 or 25 mile rides at beginner and/or intermediate pace.) Questions? Email the crew at Wharton@jorba.org Remember, it is illegal to park in the Batsto Visitor Center lot after dark. 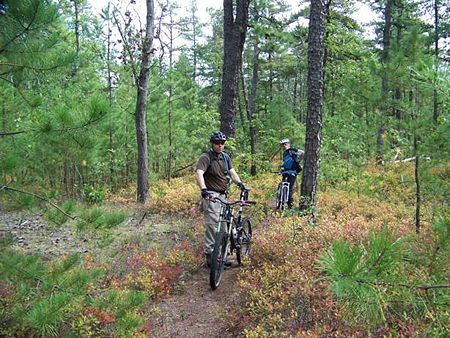 The forestry sanctioned evening rides listed are for JORBA members and others who participate in Wharton State Forest’s bicycle trail maintenance. Fire Tower Trail: Beginners will enjoy following the green circle markers for a fun easy six mile ride. Penn Branch Trail: This is the big nineteen mile loop marked with orange circles that overlaps and extends the Fire Tower Trail. 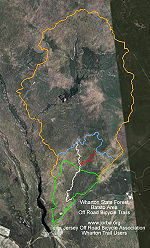 The terrain is not difficult, but this trail is recommended for experienced riders because of its length. Huckleberry Trail: This fun swoopy three mile trail is marked with blue circles and bisects the Penn Branch Trail to provide riders with an apprx. eight mile loop from/to the parking lot. Oak Hill Trail: This apprx. two mile long trail is marked with white circles and gives riders another north/south option. Teaberry Trail: Gives riders a 3/4 mile long connector trail between the Oak Hill and Huckleberry Trails. Marked with red circles.